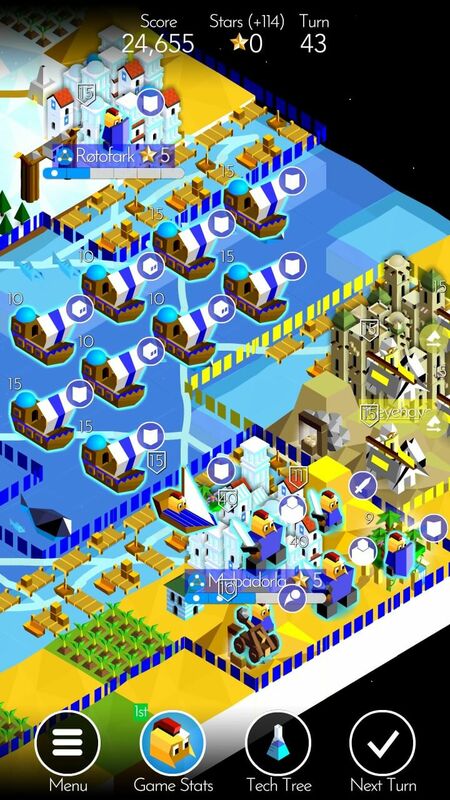 I've tried a lot of turn-based strategy games for Android and the one that I liked most is The Battle of Polytopia. It is a lightweight game similar to one of the most popular turn-based PC strategies - Sid Meier's Civilization. Because the game is small and light, it runs fine on almost all smartphones, even old ones. Another plus is that it is free and does not contain ads. The game includes in-app purchases that allows you to get access to additional tribes, but they are not mandatory to enjoy the game. A benefit of some of the paid tribes you can enjoy some new units, technologies and abilities. You start each game on a randomly generated map against one or more other tribes. Depending on the mode of the game you have selected you should either make as much points as possible for 30 turns or you should conquer all of the other tribes. The game comes with more than a dozen of different units like warriors, archers, swordsmen, riders, knights, catapults and a bunch of navy units. To gain access to each of the units you should research one or more technologies from the games tech tree. Technologies also reveal the secrets of different building and improvements you can make to your cities to make them stronger, more wealthy of increase their population. 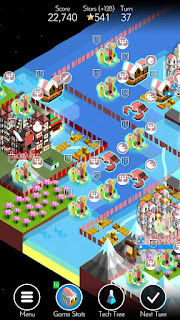 In each turn of this great Android turn-based strategy game you should decide how to best use your available resources - to research a new technology, to purchase improvements to your cities, to purchase or upgrade military units or a mix of all of these options. The artificial intelligence (AI) of the computer controlled tribes is very good, so if you want to beat them you should give your best. The Battle of Polytopia is definitely a game I would recommend to any turn-based strategy fan and especially to those who enjoy the Civilization series on the PC and are searching for something similar on Android. With The Battle of Polytopia you get a simplified, but not simple game that feels and looks great on any Android phone and will put your strategy thinking to the test!